Russia conducted its second Soyuz launch in the space of two days on Friday, with a Soyuz-2-1b successfully deploying the second Resurs-P remote sensing satellite for Roskosmos. The launch took place from Site 31/6 at the Baikonur Cosmodrome, with liftoff on schedule at 00:55 local time on Saturday (18:55 UTC on Friday). Part of Russia’s long-running Resurs programme, Resurs-P No.2 follows Resurs-P No.1, which has been in orbit since June 2013. The 6,392-kilogram (14,090 lb) satellite is designed for five years of operational service, and is the second of five Resurs-P satellites planned. Resurs-P No.2 measures 7.93 metres in length and 2.72 metres in diameter at its widest point (26 by 8.9 feet). Constructed by the TSSKB Progress design bureau, the satellite is based around a bus derived from the Yantar series of reconnaissance satellites. 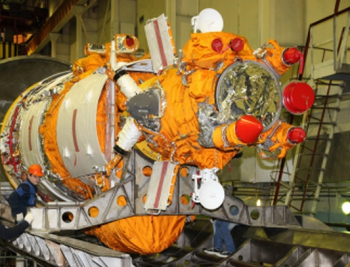 The Yantar-derived bus has become a common element of Russian spacecraft in recent years, with many new-generation military satellites also based upon this platform. The satellite is powered by twin solar arrays deployed from the aft end of the bus. These measure 5.0 by 4.5 metres (16.4 by 14.7 feet), producing electricity for Resurs-P No.2 and its instruments. Roskosmos placed an order for the satellite in November 2010, with the satellite then expected for delivery in 2013 at a cost of 2.22 billion Roubles (43.5 million dollars). The Resurs-P No.2 satellite carries an imaging payload consisting of high-resolution, hyperspectral and area survey instruments developed by TSSKB Progress and optical engineering company Krasnogorsky Zavod. The satellite’s primary instrument is the Geoton-L1 panchromatic imager, which can image the surface at a resolution of 1.0 to 3.4 metres (3.3 to 11.2 feet). Images can be transmitted to the ground in real time, using the Sangur-1U downlink system. Resurs-P No.2’s hyperspectral payload is designed to produce images at multiple wavelengths, with a spectral resolution of 5-10 nanometres. The 140 kilogram (310 lb) instrument can image the Earth’s surface with a resolution of up to 30 metres (98 feet). The final part of the imaging payload consists for two multispectral cameras for area survey; one high-resolution and the other medium-resolution. In multispectral mode the cameras can produce images at resolutions of up to 119 kilometres and 23.8 kilometres (73.9 and 14.8 miles) respectively. The cameras can also operate in a panchromatic mode, increasing their resolution to 11.9 and 59.4 kilometres (7.39 and 36.9 miles) respectively. The multispectral imager operates at visible and near-infrared wavelengths, between 430 and 900 nanometres. Its high-resolution camera can image a 97.2 kilometre (60.4 mile) swath of the Earth’s surface, while the medium-resolution instrument has a swath width of 442 kilometres (275 miles). In addition to its remote-sensing payload, Resurs-P No.2 carries a particle physics research payload, Nuklon. Built as the primary instrument of the Koronas-Nuklon scientific satellite, whose development was cancelled in 2012, Nuklon will be used to study high-energy cosmic particles. It was designed and will be operated by Moscow State University, funded by Roskosmos. Following the cancellation of the Koronas-Nuklon satellite, development of the instrument continued with Roskosmos opting to fly it on another satellite. Initially the second flight of the Russian military’s Lotos-S satellite was considered, however this was soon abandoned in favour of a Resurs-P satellite. The Nuklon payload is designed to study particles with energies between 1.012 and 1.015 keV, and consists of a spectrometer, a scintillator, an ionisation chamber and instruments to measure the charge of incident particles. Resurs-P No.2 also carries an AIS receiver, designed to collect and relay tracking and status data from ships at sea, to aid navigation and search and rescue operations. Resurs was launched by Russia’s Soyuz-2-1b rocket, which made its twenty-third flight and the forty-third launch of the Soyuz-2 overall. Derived from the older Soyuz-U and Soyuz-FG, the Soyuz-2 introduced modernised flight controls among other enhancements. A three-stage rocket under Russian nomenclature, the Soyuz-2 consists of a core stage – termed the second stage – augmented by four liquid booster rockets which are termed the first stage. The third stage sits atop the core. The Soyuz-2-1a and 2-1b variants differ in terms of the engine used to power the third stage – the Soyuz-2-1a uses the older RD-0110, while the Soyuz 2-1b makes use of the more capable RD-0124. 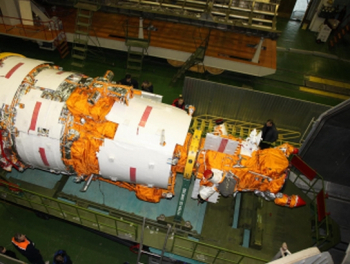 The smaller Soyuz-2-1v also uses the RD-0124-powered stage, however it omits the first stage and its core stage is re-engined with an NK-33. The Soyuz-2 first flew in November 2004, making a suborbital test flight from the Plesetsk Cosmodrome. The type’s first orbital launch came almost two years later when EUMETSAT’s MetOp-A weather satellite was deployed by a Soyuz-2-1a/Fregat flying from Baikonur. The Soyuz-2-1b made its maiden flight later that year, deploying the CoRoT observatory for CNES and the European Space Agency. In Baikonur’s local timezone, Saturday’s launch occurred on the eight anniversary of the rocket’s maiden flight. Soyuz-2 launches from the Baikonur Cosmodrome make use of Site 31/6, one of two pads at the facility used by Soyuz and formerly other R-7-derived rockets – the other pad being Site 1/5. First built for test launches of the R-7A missile, Site 31 was first used for an orbital launch in November 1962, by an R-7 flying in the obscure 11A59 configuration – known in various sources as Sputnik or Polyot – to orbit a prototype antisatellite weapon. Site 31/6 is currently the only pad at Baikonur which can support the Soyuz-2, with 1/5 expected to be refitted in the near future. Older versions still flying, such as the Soyuz-U which carries Progress resupply missions to the International Space Station and the Soyuz-FG which is mostly used for manned launches of the Soyuz-TMA spacecraft, can use either pad and from time to time Site 31 is even used for manned launches. 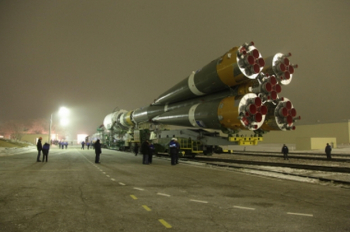 When renovation work begins at Site 1, all Soyuz launches from Baikonur will use Site 31 until the work is complete. Soyuz rockets are integrated horizontally away from the launch pad. Ahead of Saturday morning’s liftoff, the Soyuz rocket was transported to Site 31 by train and erected on the launch pad Tuesday. About seventeen seconds before liftoff, the first and second stage engines ignited. The Soyuz-2’s first stage was powered by four RD-107A engines, while a single RD-108A powered the second stage. These engines built up to full thrust through the final seconds of the countdown, while at the zero mark four swing arms retracted from the base of the vehicle freeing it to ascend to orbit. The first stage burned for around 117 seconds before burnout and separation from the core vehicle. Second stage flight continued for a further 170 seconds, with third stage ignition and separation occurring four minute and 47 seconds into the flight. A second after ignition, interstage panels protecting the third stage engine bay during ascent jettisoned, with the payload fairing separating from the nose of the vehicle at around the same time. The third stage’s RD-0124 engine burned for four minutes and 33 seconds, completing the injection of Resurs-P No.2 into its initial deployment orbit. The target orbit for Saturday’s launch was a perigee of 200 kilometres (124 miles or 108 nautical miles), an apogee of 475 kilometres (295 miles, 256 nautical miles) and inclination of 97.285 degrees. The spacecraft will circularise this trajectory at apogee during the first few days of its mission, putting itself into an operational sun-synchronous orbit. The twenty-first Soyuz launch of the year, Saturday’s launch came less than 48 hours after the successful launch of another Soyuz-2-1b from the Plesetsk Cosmodrome, which carried a Lotos-S signals intelligence satellite to orbit. Incidentally it was the same Lotos-S spacecraft which Roskosmos had considered as a potential host for Nuklon before selecting the Resurs spacecraft. The Resurs launch marked the final Soyuz mission of 2014 and Russia’s penultimate launch of the year. 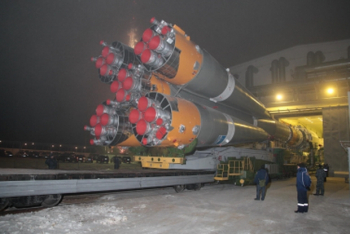 Russia will end 2014 with a commercial Proton-M launch, currently scheduled for Sunday, while China are preparing to conduct the final launch of the year on 31 December with their Chang Zheng 3A vehicle – with a launch on Saturday expected to come before that final mission. The first Russian launch in 2015 is likely to be of a Dnepr, carrying South Korea’s Arirang 3A imaging satellite, slated for 22 January. The next Soyuz mission, scheduled for 1 February, will use the Soyuz-2-1v configuration to orbit a Kanopus satellite from Plesetsk. Including Saturday’s, Russian and former Soviet rockets have conducted 35 orbital launches in 2014 – rising to 36 when Sunday’s Proton lifts off. Saturday’s Resurs launch is the eighty ninth orbital launch of the year, equalling the number of launches conducted in 1997. If either of the Proton or Chang Zheng launches take place 2014 will mark a twenty-year high in worldwide launch rates. Thanks primarily to Planet Labs’ Flock-1 satellites, which are sent into orbit in groups of up to 28 at a time, 2014 has already seen more individual satellites launched than in any previous year.